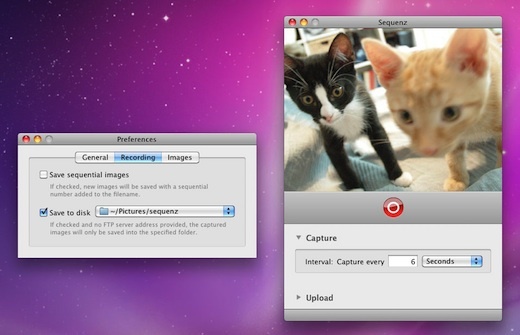 Requires Mac OS X 10.6 or greater, built-in/external iSight or any UVC compatible camera. Sequenz is Freeware, so if you like it, please Donate. Version 1.2 (Download Sequenz 1.2.zip 23.09.12) Saves FTP settings in OS X Keychain, Autostart option, sequential images are saved with timestamp filename instead of sequence number. Version 1.1 (Download Sequenz 1.1.zip 31.12.09) Save sequential images, Possibility to save images to disk, New Preferences. iSight is a registered trademark of Apple Computer Inc.